Narendra Damodardas Modi ">[ˈnəɾeːnd̪rə d̪aːmoːd̪əɾˈd̪aːs ˈmoːd̪iː], born 17 September 1950) is an Indian politician who is the 14th and current Prime Minister of India, in office since 26 May 2014. Modi, a leader of the Bharatiya Janata Party , was the Chief Minister of Gujarat from 2001 to 2014, and is the Member of Parliament from Varanasi. Narendra Damodardas Modi ([ˈnəɾeːnd̪rə d̪aːmoːd̪əɾˈd̪aːs ˈmoːd̪iː], born 17 September 1950) is an Indian politician who is the 14th and current Prime Minister of India, in office since 26 May 2014. 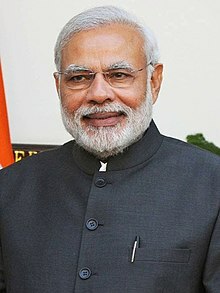 Modi, a leader of the Bharatiya Janata Party (BJP), was the Chief Minister of Gujarat from 2001 to 2014, and is the Member of Parliament from Varanasi. Born to a Gujarati OBC family in Vadnagar, Modi helped his father sell tea as a child, and later ran his own stall. He was introduced to the right-wing Hindu nationalist organisation Rashtriya Swayamsevak Sangh at the age of eight, beginning a long association with the organisation. He left home after graduating from school, partly because of an arranged marriage which he rejected. Modi traveled around India for two years, and visited a number of religious centres. He returned to Gujarat and moved to Ahmedabad in 1969 or 1970. In 1971 he became a full-time worker for the RSS. During the state of emergency imposed across the country in 1975, Modi was forced to go into hiding. The RSS assigned him to the BJP in 1985, and he held several positions within the party hierarchy until 2001, rising to the rank of general secretary. Modi was appointed chief minister of Gujarat in 2001, due to Keshubhai Patel's failing health and poor public image following the earthquake in Bhuj. Modi was elected to the legislative assembly soon after. His administration has been seen as complicit in the 2002 Gujarat riots, or otherwise criticized for its handling of it, although a court found no evidence to prosecute Modi. His policies as chief minister, credited with encouraging economic growth, have received praise, and several industrial projects were begun during his tenure. His administration has been criticised for failing to significantly improve health, poverty, and education indices in the state. Modi led the BJP in the 2014 general election, which gave the party a majority in the Lok Sabha, the first time a single party had achieved this since 1984. Modi himself was elected to parliament from Varanasi. Since taking office, Modi's administration has encouraged foreign direct investment in the Indian economy, increased spending on infrastructure, and reduced spending on health and social welfare programs. Modi has encouraged efficiency in the bureaucracy, and centralized power through the abolition of the planning commission. Modi has begun a high-profile sanitation campaign, and loosened environmental and labor laws. A Hindu nationalist and member of the Rashtriya Swayamsevak Sangh (RSS), Modi remains a controversial figure domestically and internationally. New Delhi: The Election Commission of India has banned the web series on Narendra Modi titled 'Modi A Journey of Common Man'.